The TetraFlex® system is scalable and can handle from small single site solutions with local coverage to large-scale multisite solutions, using any combination of outdoor and indoor TetraFlex® base stations. Together with the intelligent TetraFlex® software, simple and smooth site expansion is possible, even while in operation. The 100% IP-based technology provides full architectural network flexibility with all network components connected in a single state-of-the-art infrastructure without the need of a central switch. The TetraFlex® Indoor Base Stations can be configured with up to 16 TETRA carriers giving in total 64 time slots with access to all functions and terminals from the front. Excellent receiver sensitivity is achieved with the Tower Mounted Amplifier/Duplexer by eliminating receiver cable loss. Used as TMD it further gives the possibility to operate with dual diversity, using only two antennas. The TetraFlex® Indoor Base Stations are characterised by extremely Low Power Consumption. Featuring full support for battery backup as well as redundant controllers, power supplies and carriers, TetraFlex® meets your highest requirements on reliability. The intelligent distributed architecture replicates information to all sites in the network, avoiding any single point of failure. 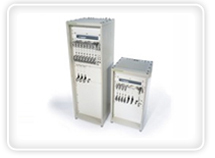 TetraFlex® is supplied with Application Gateways for easy access to the Application Programming Interface (API), Packet Data Gateways and Voice Gateways, allowing you straight forward development of customer designed applications or integration to existing telephone systems and control room equipment. As an independent TETRA infrastructure provider DAMM has developed TetraFlex® for full compatibility with all TETRA terminals, providing you with the option freely to choose your favourite terminal brand. The TetraFlex® system is available with a wide range of software such as Voice and Data Management, Dispatcher and a comprehensive Network Management tool including subscriber management and network performance statistics.